Stragalia were one of my favorite snacks growing up and a particular favorite of my great grandmother Stella. All toasted and crunchy, salty and savory with sweet golden raisins and boukovo chili flakes – I still eat these traditional toasted chickpeas by the handful! Stragalia (στραγάλια) are a delicious, very healthy, totally addictive snack that are so simple to make and a fantastic on-the-go option for work or school too! With coriander and fennel seeds, fresh ground black pepper, salt and garlic, this recipe is the perfect combination of traditional Greek spices. The secret to getting crunchy, nutty good bites every time? A very hot oven! Because of the high heat necessary for good crunchy chickpeas,I tend to stay away from using dried herbs in this recipe. Dried herbs will often burn and can leave behind an awful, acrid taste. You can safely add dried herbs (Greek oregano or mint) after the chickpeas are cooked and cooled. The spices are key here so, when you can, toast and grind them yourself. 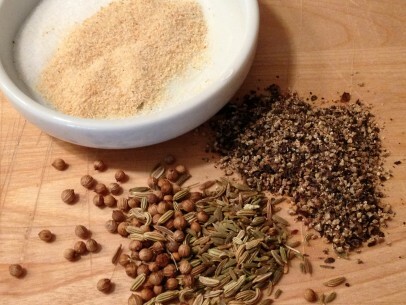 Lightly toast the fennel, coriander and cumin seeds for just a minute or two in a hot pan before grinding coarsely in your mortar and pestle or spice grinder. Grinding the spices all together helps to combine the flavors most evenly. 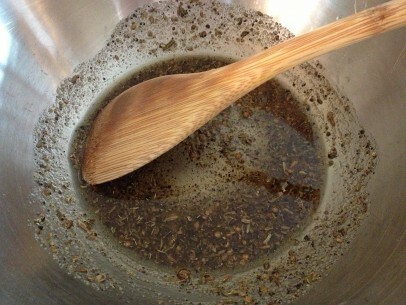 Then mix the ground spices with olive oil until you get the consistency of a loose paste. Take a sec here, hold your head over the bowl and inhale – the aromas are absolutely intoxicating! TIME SAVING TIP: Truth be told, it’s fine to use canned chickpeas in this recipe. They work well here and can save you quite a bit of time. 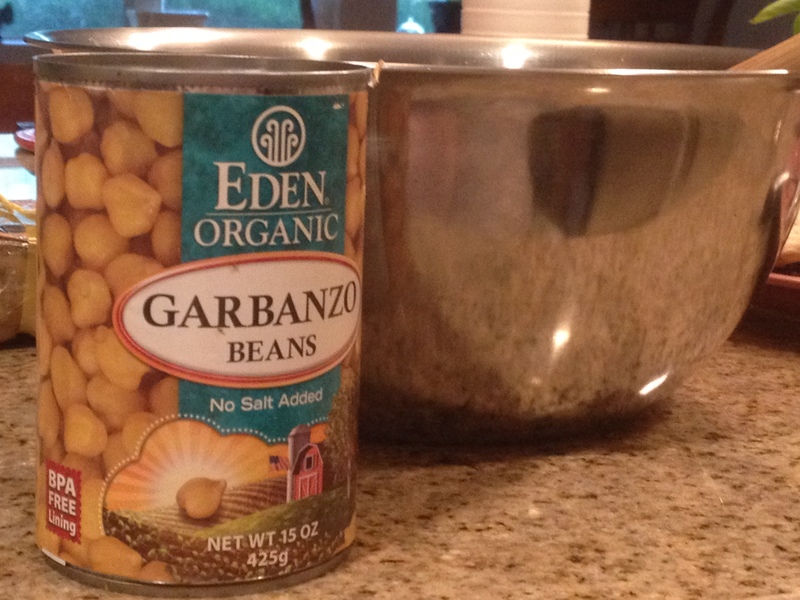 When I use canned chickpeas, Eden brand is hands down my first choice. They’re organic, the can lining is BPA free and they don’t add salt. When using canned, remember to give the chickpeas a quick rinse before using them and always pat dry well for crispy chickpeas. Give drying chickpeas a gentle rub with the dishcloth to loosen their paper thin skins. Once loosened, you can simply and quickly pluck skins right off. I really recommend taking the extra minute or two to remove the skins as they can burn and smoke in the oven. It’s a good idea to toss your chickpeas halfway through cooking as this step really helps to give you a more crunchy finished product by releasing steam from the toasting chickpeas as you turn them. When I have the time, I do like to start with dried chickpeas instead of canned. If you’d like to try this variation, I’ve written out my favorite way to cook dried chickpeas at the very end of the post. Boiling your own gives you the opportunity to flavor your chickpeas from the inside and add another layer to of yummy to every bite. And remember, you can boil your dried chickpeas days ahead of when you’re ready to toast them. ****Once cooked, chickpeas keep just fine, covered and refrigerated, for up to 5 days. 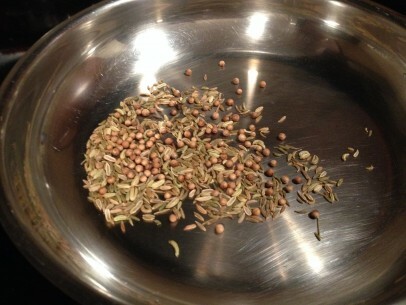 With mortar and pestle or spice grinder, grind all spices together. In a large bowl, add ground spices and olive oil. Stir to combine completely. **If you are starting with dried chickpeas, see cooking instruction below before continuing on to the next step. 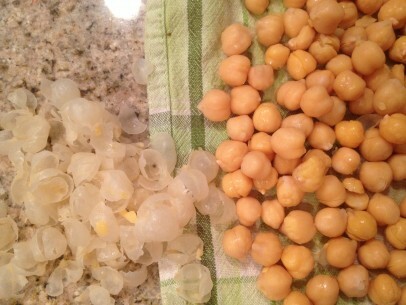 Rinse chickpeas (canned) and pat dry. Gently rub with dishcloth to loosen skins and remove as many as possible. Add chickpeas to oil and spice mixture and stir gently to coat all chickpeas well. 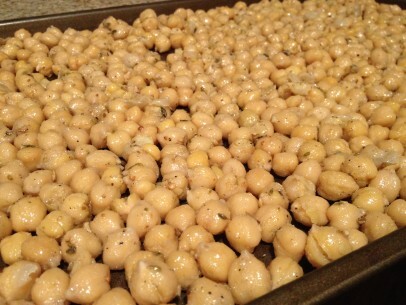 Spread coated chickpeas out onto a large cookie sheet in a single layer. Cook on middle rack of a 400 degree oven for 40-45 minutes until brown and crunchy. A packed pan may take up to 60 minutes. Give the pan a quick shake or stir with a wooden spoon about every 15 minutes to toast all sides evenly. At 35 minutes, test one to see if you’ve gotten to a good state of crunch. 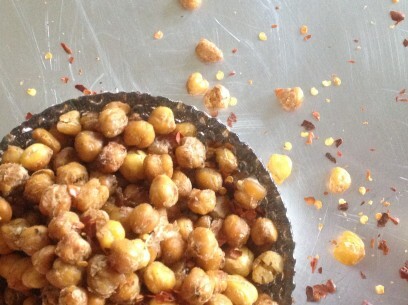 If you don’t have a ton of chickpeas on your tray, you may be done. Add the remaining 10 minutes or so more if you haven’t. I like mine a little well done and sometimes go to about 45-50 minutes. Just be careful though once you get over 45 minutes as they can quickly burn! I love golden raisins in my stragalia and fresh lemon juice adds a pop of bright flavor – give a squeeze and see what you think. Just wait a bit until your stragalia have cooled a bit to mix these in. Make sure you let them completely dry out for at least a day uncovered on the counter before storing and store your stragalia in an airtight container or plastic snack bag for 7-10 days. This recipe doubles and triples easily and turns out fantastic every time. 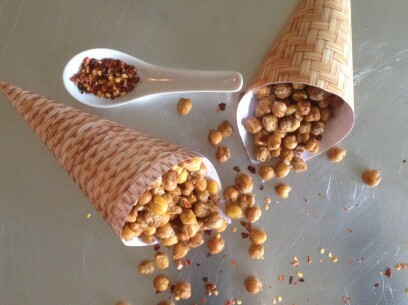 Soak dried chickpeas overnight or for anywhere from 6-8 hours. Soak them in a large pot and make sure chickpeas are covered with at least 2 inches of water. 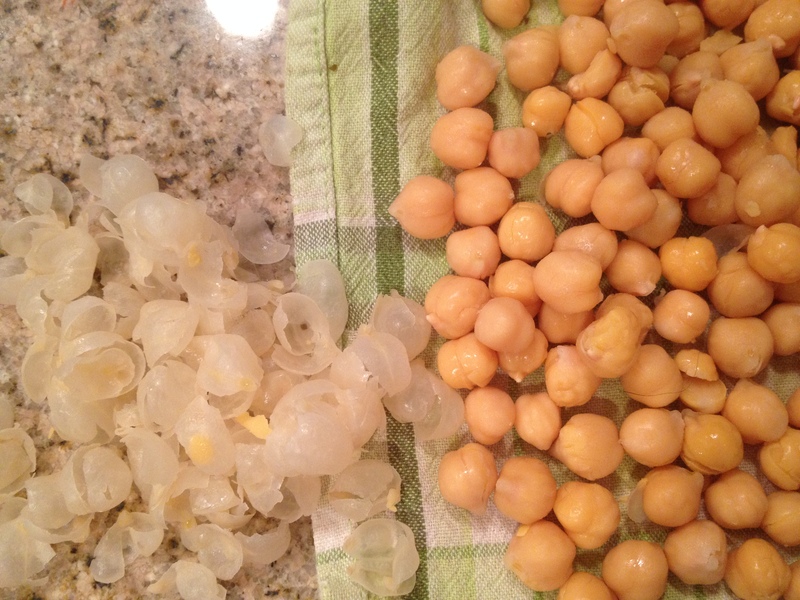 After soaking, drain and cover soaked chickpeas with at least 3-4 inches of fresh water. Bring to a rolling boil. A fluffy, stiff white foam will cover the surface of the water. Skim the foam off, lower the heat to a simmer and cook for 1 hour or until the chickpeas are still firm but squish under a little pressure..
At this point, you may choose to add a crushed clove or two of raw garlic, a shallot and perhaps a few sprigs of thyme along with a pinch of salt to season the chickpeas. Remember to remove any seasoning ingredients when chickpeas are cooked. Another seasoning option at this point in the recipe is to add a bouquet garni of Greek herbs/spices to the cooking chickpeas. Worth the extra step if you have the time! Check the water level every half hour and make sure there is always at least an inch of water covering the cooking chickpeas. Stir every half hour also. I find it very helpful to have a 2 cup measuring cup of water next to the stove to add water when necessary. You’ll know the chickpeas are close to done when the skins start coming away from the chickpeas after stirring. Hi! I love your recipes. Keep on with the good work. It tastes like flour…The lady from the shop didn’t know to tell me in English what it was. Thanks anyway. Looking forward for your next recipe. Look at the picture of the skins above; the white layer is their skins, left on. I actually prefer them that way because the skin’s rougher texture help to hold on to the seasoning and in Greece you can buy them either way. Try mixing both kinds and yes, raisins are great in the mix too.